Rihanna is one of the iconic star of all time! 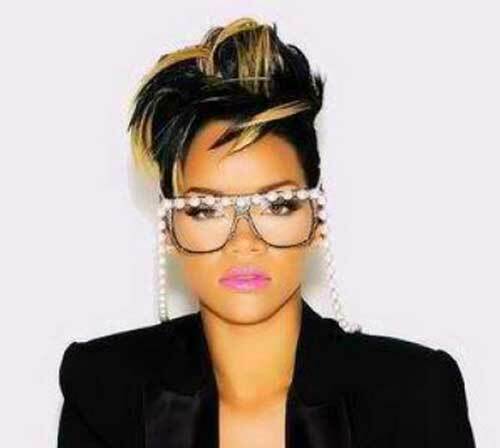 In our gallery you will find images of 15 Best Rihanna Pixie Haircuts that you will adore! Rihanna has changed her hairstyle and tried many different short haircuts but she totally rocks pixie hairstyle. 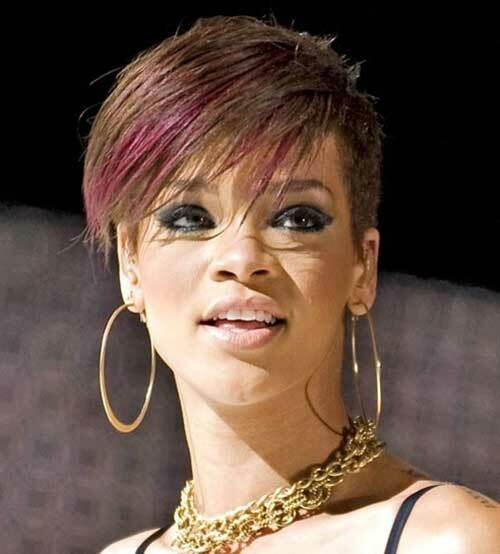 Since she has become a worldwide popular singer, Rihanna‘s hairstyles has inspired millions to follow her style sense. One of her most iconic short hairstyle is jet black pixie cut with long fringes. She has sported this hairstyle with different hair colors. She has changed color of her fringes by adding pink balayage color. Pop star also wears short pixie cut beautifully with her black hair, she has completed her look with red lips and white dress at MTV Music Award, she was just gorgeous with that style. She spiced up her pixie with short and wispy bangs and this pixie cut frames her face nicely. Here are Rihanna’s changing pixie haircuts that will make you go with pixie cut! Check these celebrity short hairstyles now and get inspired!